Autumn in England’s Lake District, a time when the richness of the colours enhances an already dramatic landscape and providing the weather is kind it becomes possible to enjoy the region truly at its best. Being a resident of Cumbria, the poet William Wordsworth was of course in the enviable position to experience the splendours of the Lake District throughout all weathers and seasons and left his experiences as a timeless legacy. There is hardly an area of the Lake District not mentioned in the writings of Wordsworth but one valley in particular inspired him to write no less than 35 Sonnets about its landscape and atmosphere. Without question the Duddon Valley was Wordsworth’s favourite. Today, the Duddon Valley must be one of the quietest and least frequented areas of the Lake District. From the source of its river at 393m above sea level near Cockley Beck’ between the daunting Wrynose and Hardknott Passes, the Duddon River flows for 15 miles through the valley. At its southern end the river becomes tidal at Duddon Bridge before flowing into the Irish Sea at Duddon Sands near Furness. 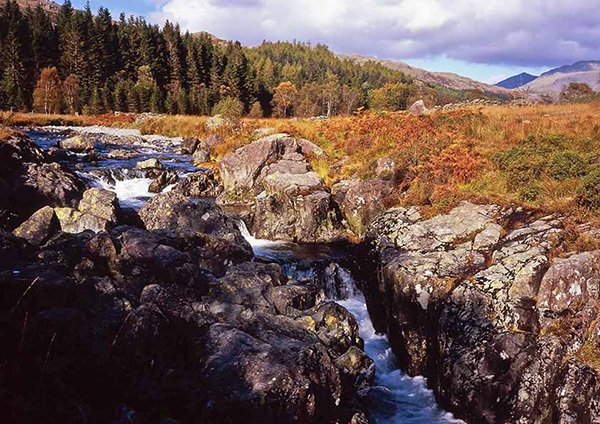 During this 15 mile journey the river encompasses a timeless and unspoilt landscape. The scene is one of remoteness and seemingly untouched yet rugged beauty; its patterns broken only by a dry stone wall or white painted farmhouse. 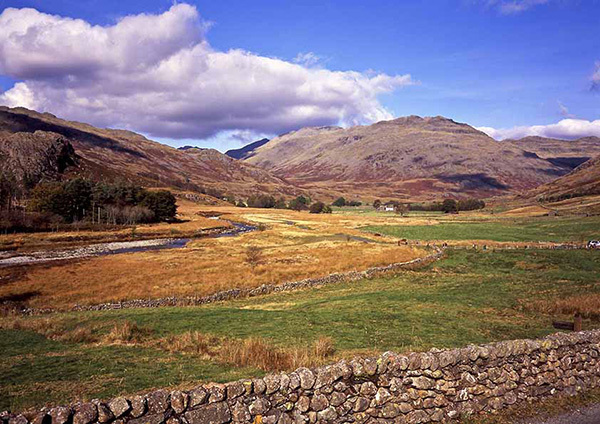 Bounded by the towering Coniston Fells and Harter Fell, Wordsworth’s valley remains isolated and peaceful. Even in summer traffic through the valley road is said to be only occasional and in autumn it can be something of a solitary journey. 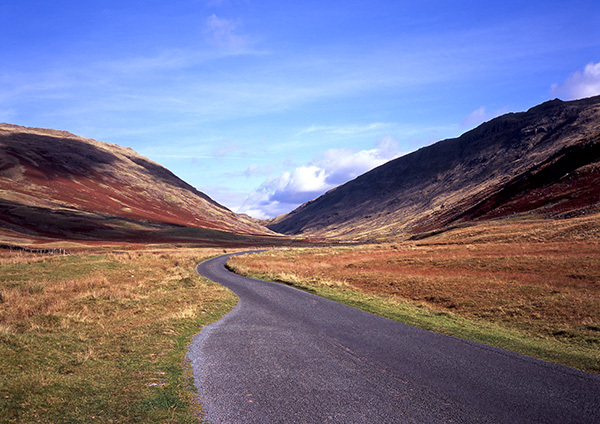 The road offers views of fells and woodlands with the river never far from view; only the higher end of the valley near the Wrynose Pass does the landscape open out with almost a touch of Alpine splendour. The sight and sounds are memorable, cattle and sheep graze, buzzards soar and only the sound of the river cascading over rocky outcrops competes with birdsong or the bleating of the native sheep. At Birk’s Bridge, the narrow river flows through a small rocky chasm, Wordsworth called this his “Faery Chasm” and even today it remains a magical spot, capable of inspiring anyone’s imagination. On a clear day brown trout can be seen in the clear waters. The tiny villages of Seathwaite and Ulpha are the only signs of civilisation in the heart of the Duddon Valley. Seathwaite offers walkers and travellers the 16th century Newfield Inn, much frequented by Wordsworth. Today, a warm welcome is assured along with home cooked food and a selection of real ales. In 1904 however the inn was at the centre of a major conflict and controversy for the area, when workers were brought in to dam Seathwaite Tarn to provide water for the increasing population of Barrow. Seathwaite was also the home of the Rev Robert Walker from 1736 until 1802 when he died at the age of 92. He preached here for over sixty years during the 1700’s. In an extremely full life, he taught the local children, brewed and sold ale, preached in the parish church and tended his sheep; for such an exemplary life he was named “wonderful Walker” by Wordsworth in his poem “The Excursion”. The small settlement of Ulpha (a name of Norse origin) contains a distinctive small white church of St John the Baptist; set above the road on the banks of the beck it heralds a wonderful view down the valley. Inside, the altar is a testament to the skills of parishioners who carved it from a local cherry tree. Today Ulpha remains a remote agriculture community served well by its combined Post Office and village shop. 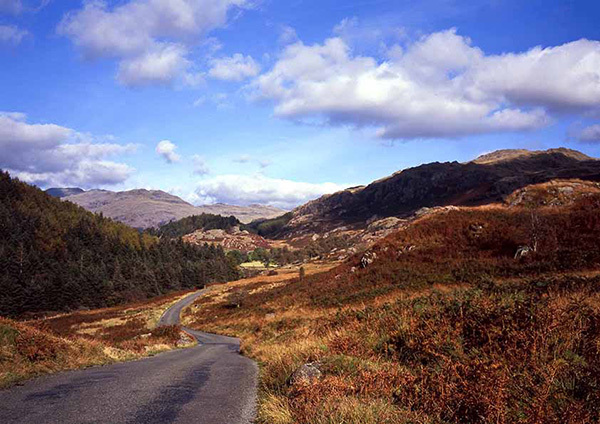 Ordnance Survey maps describe the valley near Ulpha as “Dunnerdale”, an often used synonym for “Duddon Valley”. Lakeland’s master of topography, Alfred Wainwright was adamant that “Dunnerdale” is in reality a small valley above Broughton Mills that includes the Dunnerdale Beck. Agriculture was not the only means of self sufficiency. The fast flowing waters of the river and becks provided power for both a bobbin and corn mill. The workings of quarries are also still visible on the hillsides and the slate from Walna Scar was much in demand. Examples today can be found in many of the cottages and the floor of the Newfield Inn at Seathwaite. Lower down the valley, the ancient woodlands and coppices were once the source of charcoal for the iron furnace at Duddon Bridge. Today, the remains of their round clearances can be experienced by those walking the lower slopes of the valley. On the salt marshes beyond Duddon Bridge the valley is left behind and the river here enters the tidal estuary and mudflats north west of Morecambe Bay, providing a winter base for many water birds. Here the Duddon River flows towards the Irish Sea.